One of the traditions we started when my kids were one and three years old was a birthday guest book. I wanted a fun way to record the guests who shared their party with them. I also wanted something that would be a special keepsake for them to enjoy throughout their lives. So of course I thought of books! But not your typical "guest book" - a picture guest book! Each year I choose a picture book for each of them and I connect it to the theme and their interests (which the theme is typically based on!). This also helps in remembering what they loved during the year of the party. We write "Happy (year) Birthday (child's name)" on the inside of the book and then set it up on a table with a sign inviting the guests to write their names in it with multicoloured permanent markers that we leave out beside the books. It's important to get a book with an inside cover that doesn't have a picture on it (or a small one so there's lots of room to write). If it does have an image or dark colour, you can paste a white sheet on top of it or, if it's hardcover, use the inside of the dust jacket which is usually white. I waffled between saving these somewhere safe until they were older and letting them have them now, but I just couldn't deny them enjoying the books while they're little, so the books have become part of their birthday gift (though they never know which one they'll get until the day of the party). When they grow out of the book, I'll tuck it away somewhere special for them - and maybe they'll save it for their own kids someday! It's been fun seeing the signatures change from parents writing it for the kids, to tentative first attempts at writing their own name, to confident name writing now for most of Miss M's friends. As they get older I will encourage them to leave personal notes and well wishes in the books for the guest of honour. It's become something I look forward to each year - choosing the book and then gifting it to my kids - and something they love looking at whenever we read the book. 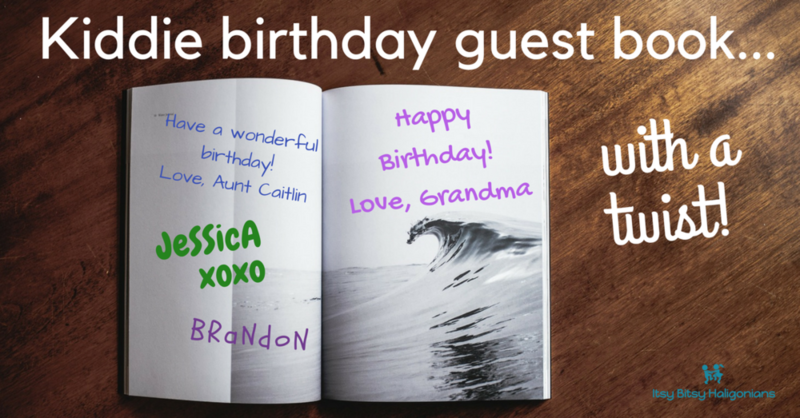 Do you have a special birthday tradition for your children? Older PostHow Does a Parent Prepare for Grade Primary?